Then this morning, it happened again. Writing a quiz for Calculus, I needed a related rates problem. Getting irritated with the lousy selection of choices online, I decided that I needed to try to create my own. And I wanted to go #3Act and after some preliminary brain storming with John Golden (@mathhombre) (Dan Meyer’s Taco Cart? Nah… rates of walkers not really related…) we found some potential in Ferris Wheel (also by Dan Meyer)! Between my curiosity and my morning got mathy in a hurry. Meanwhile Dr. Golden found a video of a double Ferris wheel, which was pretty awesome. Seemed a little it out of my league, so kept plucking away at my original goal. So, what is the product of all of this curiosity and random math problem-solving? As I see it, these past 48 hours have done two things: Reminded me of what makes me curious and reminded me what it’s like to be a learner. I have a feeling my students will be the beneficiaries of both of those products. There’s a certain amount of refreshment that comes from never being too far removed from the stuff that drew us to math in the first place. The problem you want to solve just because you want to see what the answer looks like. And this process breeds enthusiasm. Enthusiasm that comes with us into our classrooms and it spreads. I’m not trying to be cheesy, but much has been said about math functionality in the modern economy, how essential it is in college-readiness and the like with few tangible results. Let’s remember that there are kids who are moved by enthusiasm, who will respond to joy, who will pay attention better simply because the teacher is excited about what they are teaching. It won’t get them all, but neither will trying to convince them of any of the stuff on this poster. Now, who’s going to teach me how to use Geogebra? When our students have graduated high school, we will know we educators have done our job because _____________________. So, a lot gets said about the struggles of American secondary education. Recently, Dr. Laurence Steinberg took his turn in Slate coming right out in the title and calling high schools “disasters”. Which, as you can imagine, got some responses from the educational community. Go ahead and give the article a read. I’ll admit that education is not known as the most provocative topic in the American mainstream, but Dr. Steinberg has written a piece that has been shared on Facebook a few thousand times and on twitter a few hundred more. It’s instigated some thoughtful blog responses. You have to respect his formula. He starts with a nice mini Obama dig. Offers a “little-known” study early to establish a little authority. Then hits the boring note and hits it hard. High school is boring. Lower level students feel like they don’t belong. Advanced students feel unchallenged. American schools is more boring than most other countries’ schools. Like it or hate it, that is an article that is going to get read. Nothin’ to it, right? It’s as easy as making our students “grittier”. Now, I will repeat the introductory thought: When our students have graduated high school, we will know we educators have done our job because _____________________. That blank gets filled in a variety of ways from the area of employability, or social responsibility, or liberation and freedom, or social justice to a variety of other thises and thats that we use our high schools for. We are using our high schools as the training ground for the elimination of a wide variety of undesirable social things. We’ve used our schools to eliminate obesity, teen pregnancy and STIs, discrimination based on race, gender, or alternative lifestyles. We have allowed colleges to push college-readiness to make their job easier. We’ve allowed employers to push employability to make their jobs easier. The tech industry feels like we need more STEM. There’s a push-back from folks like Sir Ken Robinson who feel like it’s dangerous to disregard the arts. And they all have valid points. I’m certainly not mocking or belittling any of those ideas. However, very little is getting said on behalf of the school. We are treating the school as a transparent entity with none of its own roles and responsibilities. It is simply the clay that gets molded into whatever society decides it should be. Well, since the 60’s, society has had a darned hard time making up its mind about what it wants and so the school has become battered and bruised with all the different initiatives and plans, data sets, and reform operations. Reform is an interesting idea when the school hasn’t ever formally been formed in the first place. Public enemy #1 needs to be the utter and complete lack of purpose in the high school system. We are running our young people through exercises… why? For what? What do we hope to have happen at the end? When we decide the answer to that question, then we eliminate the rest. It isn’t lazy to say, “I’m not doing that, because that isn’t my job.” It’s efficient. If you start doing the work of others, you stop doing your work as well. We’ve never agreed on the work of the American high school, but I suspect some of what we are asking it to do should belong on the shoulders of something or someone else. I suspect as soon as we establish a purpose and simplify the operations around that purpose, we can start to see some progress on the goals that we have for our schools, which will spell success for our students and start to clean up the disaster that so many feel like the high schools currently are. Perplexing the students… by accident. It seems like in undergrad, the line sounds kind of like this: “Just pick a nice open-ended question and have the students discuss it.” It sounds really good, too. Except sometimes the students aren’t in the mood to talk. Or they would rather talk about a different part of the problem than you intended. Or their skill set isn’t strong enough in the right areas to engage the discussion. Or the loudest voice in the room shuts the conversation down. Or… something else happens. It’s a fact of teaching. Open-ended questions don’t always lead to discussions. And even if they did, class discussions aren’t always the yellow-brick road lead to the magical land of learning. … and I had asked them to pair up the corresponding parts. The first thing that happened is that half-ish of the students determined that in figures that are connected by a scale factor (we hadn’t defined “similar” yet), each angle in one image has a congruent match in the other image. This is a nice observation. They didn’t flat out say that they had made that assumption, but they behaved as though they did and I suspect it is because angles are easier to measure on a larger image. So, being high school students and wanted to save a bit of time, they measured the angles in the bigger quadrilateral and then simply filled in the matching angles in the other. Here’s were the fun begins. You see, each quadrilateral has two acute angles. Those angles have measures that are NOT that different (depending on the person wielding the protractor, maybe only 10 degrees difference). 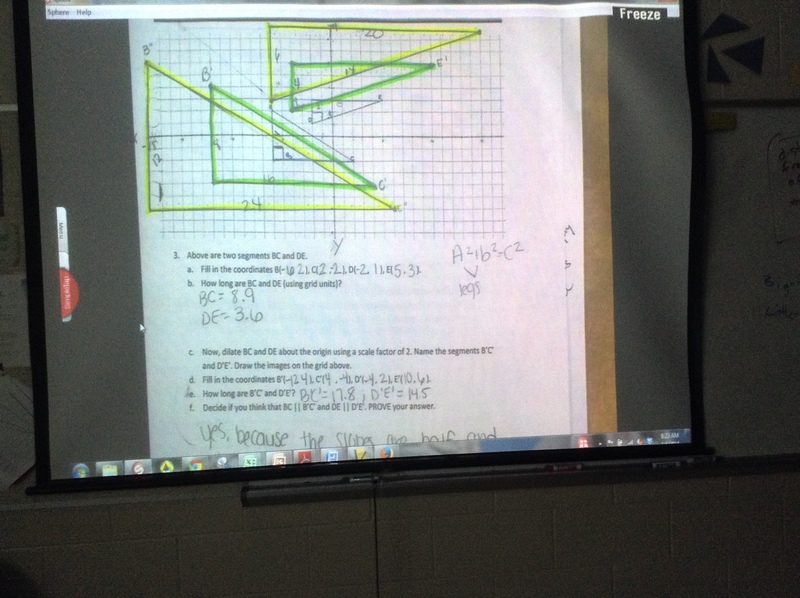 And it worked perfectly that about half of the class paired up one set of angles and the other half disagreed. And they both cared that they were right. It was the perfect storm! Not wanting to remeasure, they ran through all sorts of different explanations to how they were right, which led us to eventually try labeling side lengths to try to sides to identify included angles for the sake of matching up corresponding sides. But, that line of thought wasn’t clear to everyone, which offered growth potential there as well. 1. 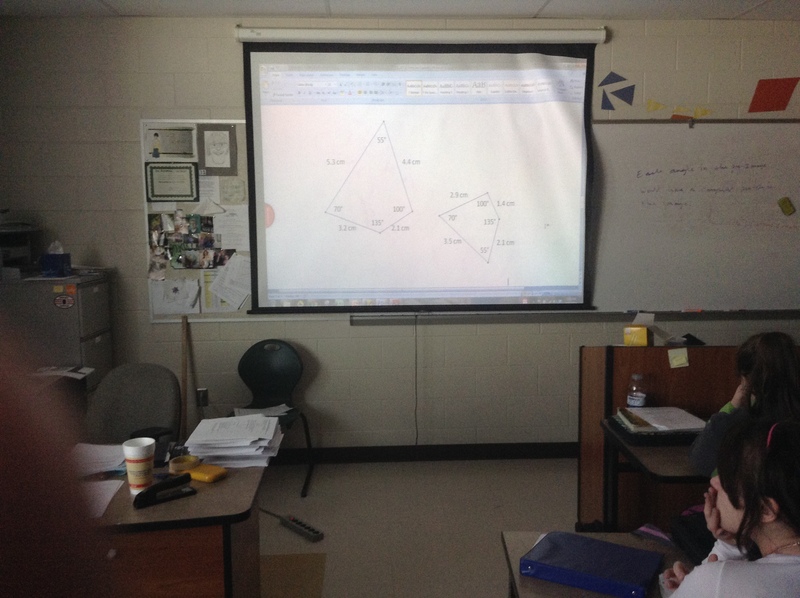 Matching corresponding parts in similar polygons is not nearly as easy as it is in congruent polygons. 2. 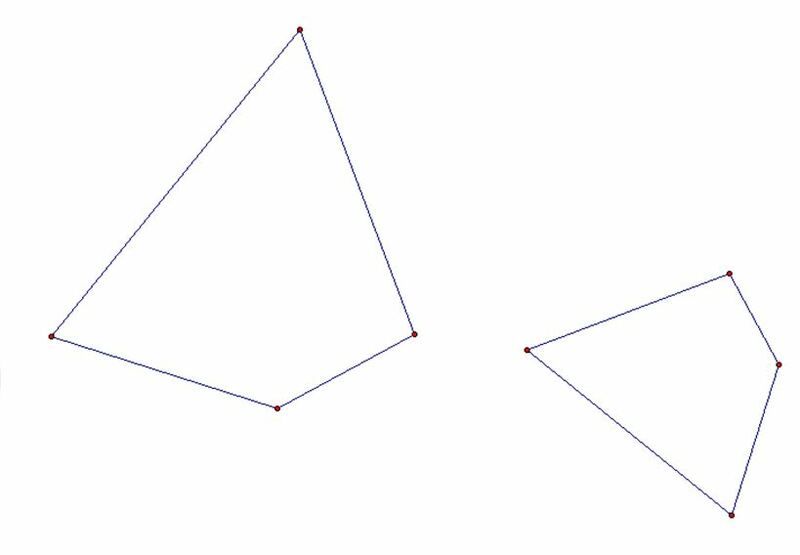 Similar polygons have congruent corresponding angles. 3. The longest side in the big shape will correspond to the longest side in the small shape. The second longest side in the big, will correspond to the second longest side in the small. The third… and so on. I’d say that’s a pretty good set of statements for a class discussion I never saw coming. Only, here’s the thing: Not every class who needs to explore a topic for the second time in the same situation. As part of my data collection for this trial, I am exploring the mean of the top 10 scores of each class as well as the scores of the bottom 10 scores on each individual assessment. I am doing this with two classes. One had a Top10-Bottom10 gap of 46.1 percentage points. The other class had a gap of 33.6 percentage points. My reason for exploring this gap is that if a group is struggling to meet the 70-at-70 line, I want to know if where the mastery of those who understand the material compares to the mastery of the students who are struggling. If there’s a lot of mastery among the top performers and a very low amount of mastery among the lowest performers, then the reteaching session becomes a little bit tricky because a large chunk of the class fits into two categories: Those who get it really well and those who don’t get it very well. Both of those groups are naturally resistant to reteaching. One because it is completely unnecessary and the other because it is completely uncomfortable. All of which makes for a very delicate classroom management strategy for that hour, which I didn’t have today. I should have seen it coming. The successful students were not inspired to support the struggling students, and in fact (a few of them) blamed the struggling students for what they considered to be a meaningless class period. The struggling seemed uncomfortable. I kept forcing them to do work they didn’t know how to do. … as opposed to the other group where the majority felt like they had nothing to gain. But like differentiating the Great Alexander and Rome, it is difficult to fully understand one without, at least a mild working understanding of the other. Julius Caesar was said to be incredibly motivated by all that Alexander accomplished. Pompey the Great (one of Julius Caesar’s brothers-in-law turned rival) returned from campaign and wore the cloak of the Great Alexander in Triumph. To assume that you can study Rome while completely ignoring Alexander would be to leave a lot of the story untold. Likewise the other way around. If someone were to try to consider the greatness of Alexander (“great” in the sense that he was mighty and powerful, probably not because he was a fantastic guy…), to ignore how his conquests contributed to the formation of the ancient world would be to leave a lot of the story untold. They aren’t the same, but they are connected. And so it is with Algebra and Geometry. Yes they’re different. They need to be taught differently, but they require each other. There are times when algebraic methods and thinking fit in really, really well with geometry concepts (similarity, 3-D figures, and circles, for example). There are also time when it doesn’t fit in as well (rigid transformations and triangle congruence, for example). It’s the same with Algebra. There are times when geometry works well to support the learning of algebra (distance formula, numeracy with the number line, slope and rates of change, for example). There are also time when geometry doesn’t fit in as well. As math teachers, we need to have a discipline to let the content dictate the techniques. My main critique of most geometry textbooks is that they are incredibly heavy in the algebra. This problem is probably working too hard to try to put Algebra in a place where it isn’t a natural fit. 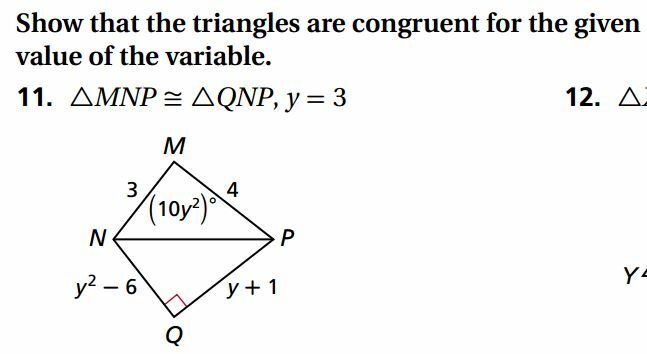 If a student were going to try to prove that triangle NPM is congruent to triangle NPQ, wouldn’t trying to prove a reflection be a much more reasonable choice? So, I suppose that I am simply recognizing that as we meander through the wonderful course of geometry, it would be wrong to make it algebra-heavy. It would be wrong to make it algebra-free. Perhaps our goal as teachers whose course is between Algebra I and Algebra II is to show the students what algebra looks like and how well it works when it is used in the appropriate spots.